Ara, Sean Ahlquist's daughter, interacting with the Social Sensory Architecture pavilion. Courtesy Mike Hensel/Sean Ahlquist, University of Michigan. Good architects have always designed with tactile sensations in mind, from the rich wood grain on a bannister, to the thick, shaggy carpet at a daycare center. It’s an effective way to engage all the senses, connecting the eye, hand, and mind in ways that create richer environments. But one architecture professor at the University of Michigan in Ann Arbor is working on a tactile architecture-for-autism environment that does much more than offer visitors a pleasing and diverse haptic experience: It’s a form of therapy for kids like 7-year-old daughter Ara, who has autism spectrum disorder (ASD). Ara, Sean Ahlquist’s daughter, interacting with the Social Sensory Architecture pavilion. Courtesy Sean Ahlquist, University of Michigan. Social Sensory Architectures, an ongoing research project led by Sean Ahlquist, creates therapeutic structures for children with ASD. One prototype, the sensoryPLAYSCAPE, is a tent-like pavilion made of tensile fabric stretched over rods to create an immersive environment. 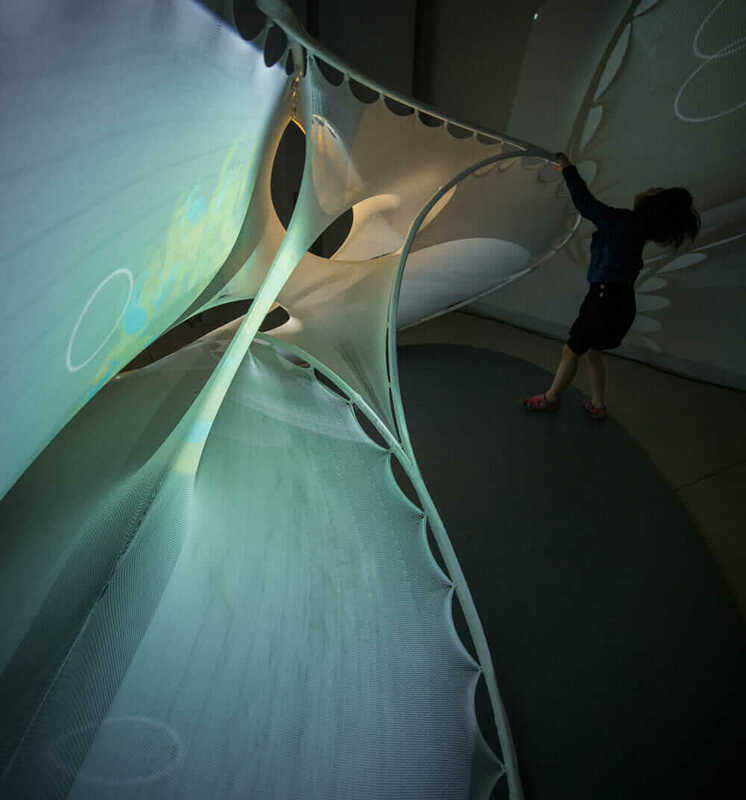 Responding to touch, sounds are triggered, and 2D imagery is projected onto the fabric’s surface, as if on a screen. This visually demonstrates the connection between motor skills and auditory and visual feedback, helping children with autism adjust the amounts of force appropriate to apply at a given movement—a common issue among those on the autism spectrum. As a PhD researcher at The Institute for Computational Design (a hub at the University of Stuttgart for research in lightweight architectural materials, where Frei Otto founded the Institute for Lightweight Structures), Ahlquist focused on pre-stressed tensile structures. When he came to Michigan in 2012, he continued his research using a CNC knitting machine, which gave him the ability to create his own textiles. The more he researched different kinds of light, tactile materials, the more he noticed something odd about how people interact with them once they’re fitted together into a structure. Ahlquist wondered if he could bridge this sensory gap. Could he make an immersive space that encourages direct tactile interaction? His daughter’s autism muted her senses, making her crave “really strong tactile feedback,” he says, but her motor-control skills were underdeveloped. Social Sensory Architectures connect these motors skills to visual and auditory feedback in an all-encompassing, whirling web of parabolas and spirals. If she’s not intuitively aware of how hard she’s pressing on something, the visual and auditory cues clue her in. Social Sensory Architectures (which won the Speculative and Prototyping Category in in SXSW’s Place by Design competition) relies on architecture’s unique ability to work on multiple senses at once—and as such, it’s required a diverse project team to bind all these elements together. Ahlquist worked with computer scientists on the software, as well as experts in music, autism therapy, psychiatry, and kinesiology. Soon they’ll begin a series of pilot studies, starting with samples of four to five kids. The team’s working hypothesis: “If we can improve motor skills, there is a correlation to creating opportunities for social interaction,” Ahlquist says. For kids on the autistic spectrum, observing and appropriately responding to social cues is often a challenge. He hopes his work can help kids with ASD better network their own senses and, subsequently, improve social relationships with each other. 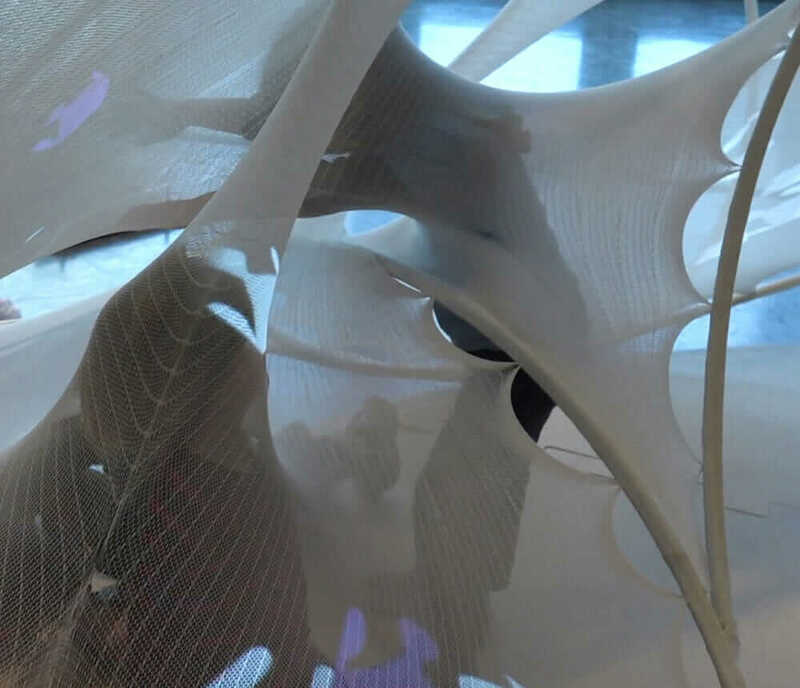 For example, some of the visual responses that the structures can produce can only happen when two kids synchronize their interactions with the textile surfaces. And the child-size tunnels and cones in the pavilion beg for helpful dads like Ahlquist to pick up kids and let them slide through. These interactive moments form “circles of communication”—a term learned through collaboration with the PLAY Project—which are especially critical when kids are otherwise nonverbal, like Ara. 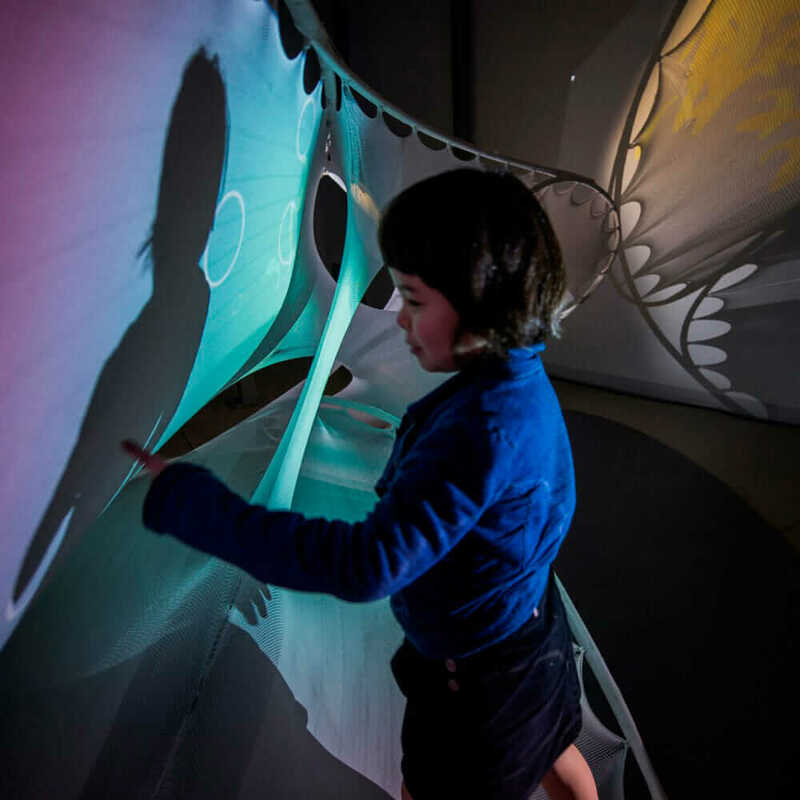 Children immersed in the Social Sensory Architecture pavilion. Courtesy Gregory Wendt/Sean Ahlquist, University of Michigan. 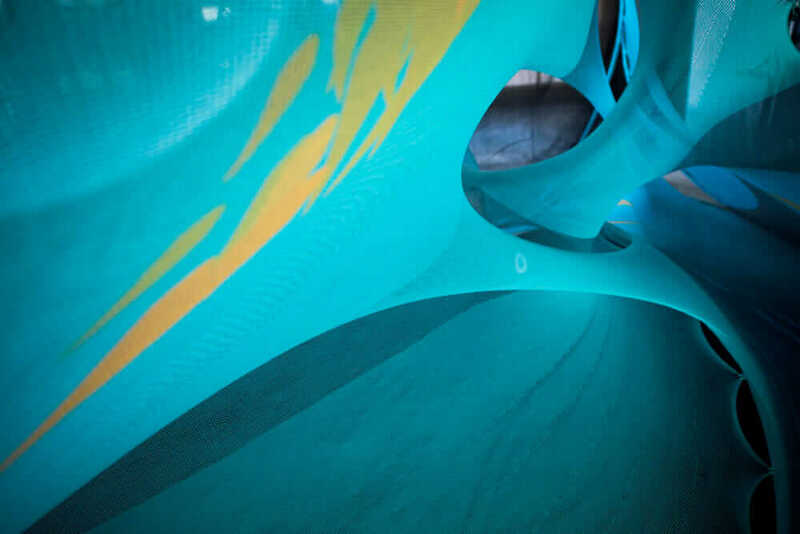 The fabric in Social Sensory Architectures is given shape by flexible glass fiber–reinforced polymer rods. A Microsoft Kinect sensor detects when the surface of the fabric is stretched in gradients, from a hard to a soft touch, and feeds this information through software developed by Ahlquist and his team. The Kinect is housed in a hardware tower (with a computer, speakers, and a projector) a few feet from the pavilion. It works a bit like a “textile iPad interface,” Ahlquist says. One software program for the pavilion surrounds children with a swarm of fish—each with their own signature wind-chime theme—that scatters with a light touch, but is attracted to stronger, continuous pressure. Another program, developed for the 2D screen, lets kids paint in colors that range from light to dark depending on the force exerted. (A delicate swipe makes a yellow mark; a hearty punch generates red). The 2D screen is currently installed at Ara’s autism therapy center, where she works on fine-tuning motor skills through sequential tasks, like stacking blocks. When kids with autism lose patience for tasks like these, they recharge in sensory rooms that—like Ahlquist’s project—feature lots of kinesthetic and sensory impressions. Ahlquist wants his project to break down the barrier between task-like therapeutic activities and fun sensory room play. “If both of those two things are needed, wouldn’t it be better if we could actually merge both of them together and minimize the task-oriented nature of developing whatever skill they’re trying to develop?” he says. The Social Sensory Architecture pavilion. Courtesy Sean Ahlquist, University of Michigan. In today’s world, immersing oneself in multisensory media screens isn’t usually seen as a recipe for developing skills. Psychologists often warn that the digital interfaces bombarding children’s ears and eyes are overstimulating—keeping them from sleeping at night and shredding their attention spans. 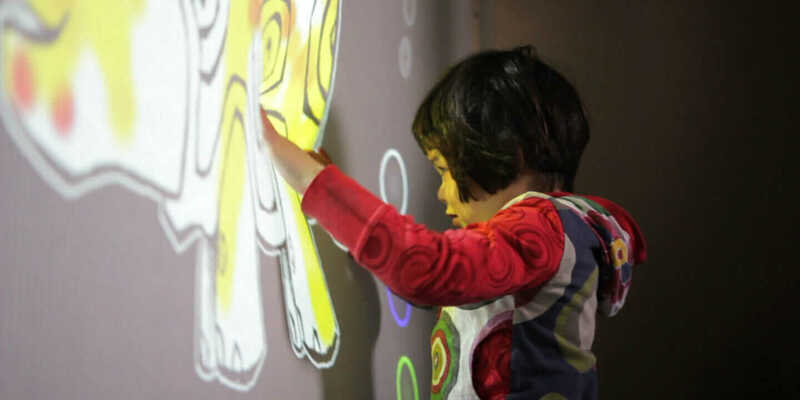 But for Ahlquist, the connection to movement and motor skills differentiates these multisensory screen-based environments. Architecture is one of the few design mediums that requires full physical interaction. Creating responsive, sensory environments like these—physical spaces that support increased mind-body connection, help develop skills, and expand social interaction—could be a powerful tool in the treatment of autism. IoT and AI and VR, oh my! Learn all about it in our newsletter. By signing up, I acknowledge the Autodesk Privacy Statement. Will a Vibrant New Skyline Finally Give San Jose a Sense of Place? Get smart on the future of making.